The Linea CFX® range comes in five different designs to suit either contemporary or classic interiors. Linea CFX® has a separate back frame and our patented four point face plate clipping system, allowing the option of matching or contrasting elements. 1. 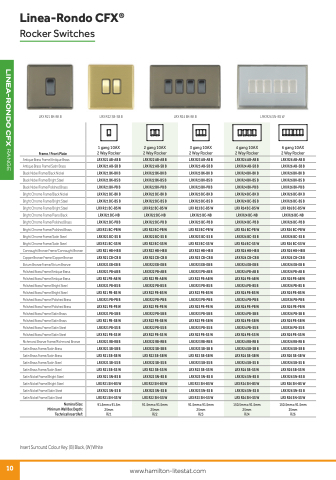 Select the required electrical accessory from the following pages. e.g. LRX R21 = Linea-Rondo CFX 1 gang 10AX 2 way Rocker Switch. e.g. Bright Chrome = BC-_ _ _.
e.g. Satin Steel = _ _ -SS _.
e.g. White = _ _ -_ _ W.